We’ve all asked for help online and been given a succinct answer that, while probably 100% accurate, wasn’t any help at all because the helper assumed we knew something we didn’t. So frustrating! In these posts I’ll cover the most simple, basic building blocks of Unity scripting without making too many assumptions, and I’ll be glad to help out if anything I present here doesn’t live up to that goal. You know the basics of using Unity – creating scripts, what a prefab is, etc. Follow the basic tutorials available at Unity3D.com if you need to. You understand general programming/scripting terminology (variable, method, etc.). You can modify these public values in the editor while working on your game. And of course, being public, these variables can be accessed by other scripts in your game too. HINT: For Boolean variables, a tick means ‘true’ and no tick is ‘false’. HINT: You can change public variables in real-time as you debug your game in the Unity editor, which lets you see the effect of different values. Remember to still set the values of these public or serialized fields (either in the Inspector or via a script) or you’ll get an exception when you try to access the (null) values. It’s very useful to use public variables to hold references to gameobjects, transforms, etc. When you do this, you can drag-and-drop items from your scene into the variable’s public value. …then drag-and-drop any game object from your scene into the empty field. Your script can now access that game object via the MyGameObject variable. This is great for improving workflow. Of course you can use a list of GameObjects and drag-and-drop multiple objects into that list, such as a list of UI buttons or enemy spaceships. Unity is also clever enough to infer the correct component if required. 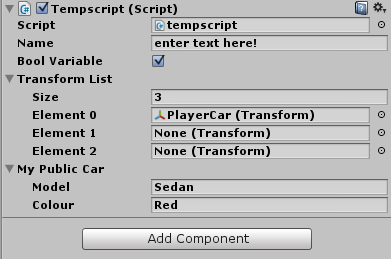 For example, if you have a public Transform variable and drag a GameObject onto it in the editor, Unity will know to grab the GameObject’s transform to put into the public variable. This makes it much less fiddly than it could be. That’s how public and serialized variables work in Unity’s Inspector! Select the new game object in the Hierarchy . Change the script’s name to DemoScript*. Double-click the script name in the Inspector to opens the script in your script editor. Copy and paste the script code below into the empty script. 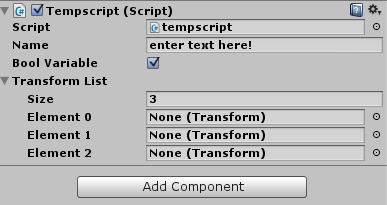 Go back to Unity, where the public variables are now available to edit in the Inspector. * In Unity, the script’s filename must match the class name. In the code below the class name is DemoScript, so the filename must also be DemoScript. You can of course change the name, but must change both the filename and the class name. // the rest of your code goes here! // you need to DO something with all those variables! That’s the basics of how Unity handles variables in ways specific to creating games easily. In Part 2 I will explain the MonoBehaviour class’s special methods such as Update() and Awake(), and how they make game-specific functionality easy to handle.